ACCU-LOC® MOUNTED UNITS have Concentric Locking collars 51000 Bearing Steel W/Black Oxide Finish Cast Iron Housing inch series. Excellent for High Speed Applications Minimizes Vibration and Noise. ACCU-LOC® Collar is Easy to Install and Remove Does Not Damage Shafting. ACCU-LOC® locking collar is designed for high-speed applications. It provides true shaft centering to minimize vibration and noise. The AMI locking collar has a chamfered edge that produces a significant increase in holding power. The collar is easy to install and remove, simplifying maintenance. And it does not damage the shaft. 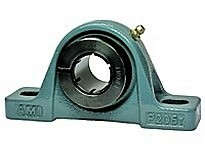 We like this design for a concentric (even) squeeze on the shaft and allows the bearing to load evenly. Instead of the traditional set screw locking collar that pushes into the shaft in one direction. Contact us if you have any questions.